SPONSORED: At the Alaska Native Medical Center, traditional foods provide comforts of home. This isn't your ordinary hospital menu, because ANMC is no ordinary hospital. In the heart of Alaska's largest city, the 167-bed ANMC facility serves Alaska Native and American Indian people from all walks of life. Some live in Anchorage. Some travel to the hospital from communities in other parts of the state. Many bring appetites for subsistence foods. Which raises the question: How do you provide traditional meals within the sterile, heavily regulated walls of a hospital or other health care facility? It takes a village–a vast network of donors, staff and Alaska tribal organizations. To ANMC, traditional food is worth the effort. "It plays a very important role: Our people, for generations, have lived off the land," said Vivian Echavarria, ANMC's vice president of professional and support services. "Where in America can you find traditional foods in a hospital? You can find it here at ANMC." Providing it isn't easy. Hospital food services are carefully regulated. So is subsistence fare. It took an act of the federal government–the 2013 Traditional Foods Nourishment Act–to pave the way for regular subsistence service at public and nonprofit facilities. Prior to that federal legislation, about 30 percent of ANMC's inpatient menu was comprised of traditional items. These days, about 60 percent of the menu contains subsistence foods, Echavarria said. Items range from simple favorites like caribou stew to modern fusions like pizza topped with fiddlehead ferns. 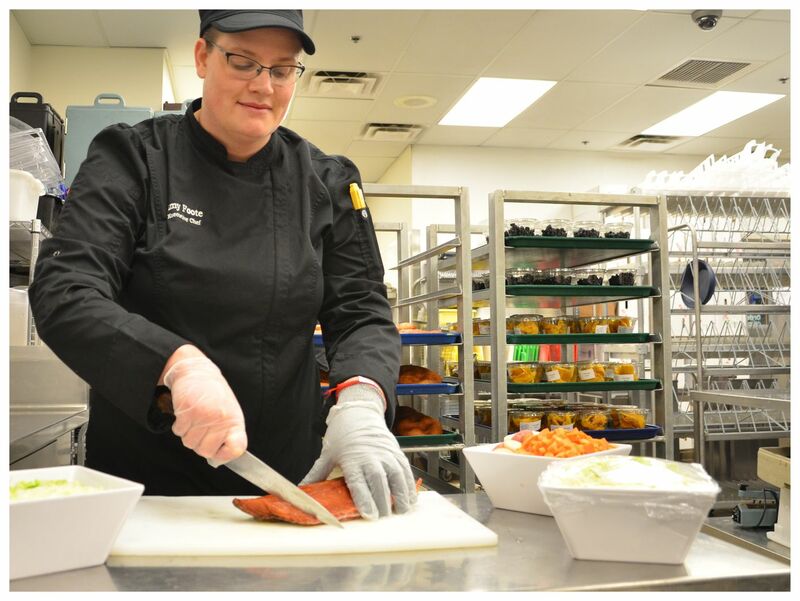 ANTHC Executive Chef Amy Foote prepares salmon for ANMC patients. The traditional options bring visible benefits. Just ask Dr. Gary Ferguson, senior director of community health services at the Alaska Native Tribal Health Consortium. "Often when you smell something, it reminds you of home or a memory. And so these foods bring people back home," Ferguson said. "The smile we see on some of these patient's faces … it's such a beautiful thing to experience." At Alaska Native Tribal Health Consortium, the nonprofit Tribal health organization that co-manages ANMC, Ferguson oversees statewide initiatives ranging from clinical research services to wellness, prevention and environmental health programs. Traditional foods have a multifaceted effect, he found. They can make patients feel comfortable and cared for. They can show patients that their culture is valued and recognized. They can have a healing, restorative effect. "Traditional foods are incredibly nutrient dense, when you compare to some of our more processed western foods," Ferguson said. "And Western food, for a lot of elders, is not what they prefer." The ANTHC doctor points to Hippocrates, long considered the father of scientific medicine. "Let food be thy medicine and medicine be thy food," the physician is famously quoted as saying. "I really feel like that is a really core concept; that food is medicine, and it's not just the nutrients," Ferguson said. While the 2013 federal legislation helped open the door to serving more traditional foods at Native hospitals and health care facilities, hurdles remained. Most subsistence foods are unavailable at the local supermarket. Things like Alaska salmon and berries can be bought and sold, but items like seal, moose, herring eggs and tundra greens cannot. To serve those coveted subsistence foods, health care organizations must obtain them through donors who hunt, fish and gather the items themselves. In Kotzebue, a recently opened traditional food processing facility handles everything from moose and caribou to sheefish and salmon and various birds. "The biggest challenge is seeking donations: Folks who go hunting, they aren't necessarily able to share," said Mellisa Heflin, a program coordinator with ANTHC's Elder Outreach program. Regulations differ depending on the type of health care facility. At hospitals, requirements for in-patient menus are strict: Donated subsistence foods must be stored separate from other kinds of food, and prepared in accordance with strict, specific regulations. Other types of facilities have more leeway. With a permit from the Alaska Department of Environmental Conservation, some kitchens are free to store and prepare donated traditional foods. Still, a successful traditional food program relies on cooperation between federal, state and private entities; established nonprofits and individual Alaskans, Heflin said. At a recent nationwide conference — Uniting Nursing Homes in Tribal Excellence — she explained the process to curious care providers. "The biggest question that we run into is 'How do we work with our state and federal regulatory agencies on serving these?" Heflin said. To arrange monthly potlucks at various care facilities around Anchorage, Heflin turns to the Alaska Native community, reaching out to potential donors via social media and email. When people understand where the food is going, they're usually happy to help. "Their first question is, 'How much do you need?'" she said. There are three Tribal nursing homes in Alaska, Heflin said. In Anchorage, many Tribal nursing home residents come from the Yukon-Kuskokwim Delta. They may crave black dry fish or akutaq or fresh fall moose. Serving those traditional foods at regularly scheduled luncheons is a way to incorporate Alaska Native values and traditions into everyday life. "Even though they are far from their communities, they have that taste of home once a month," Heflin said. If you are interested in donating traditional foods such as moose, caribou or seal, please visit ANMC's Traditional Native Foods Initiative website.